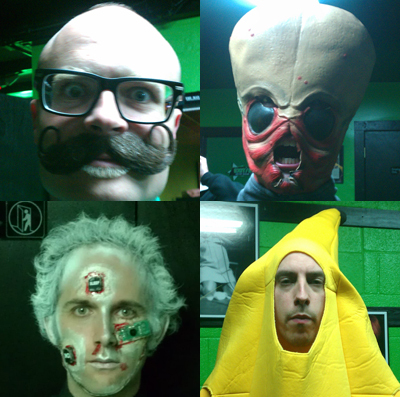 « Frontalot Fall Tour 2011: Arrrrrrkansas. And St. Louis. Another thing they dream about is playing a spectacular Halloween show with their good pals the Protomen and extra-terrestrial entertainers Peelander-Z. This happened! I’ve been a huge fan of the Protos ever since I met them at the first PAX East and decided that they were real swell folk in addition to being monster musicians. It took a year and a half of attempting to get the stars to align, but they finally did back in August when we were offered the opening slot on the bill at Nashville’s famous Exit/In. The challenge was then to convince my tour mates that the long drive to Gainesville the next day would be worth it. I mean, DUH. Of course it would be, right? Yet I had to use all of my corporate influencing-people skills to get them to agree to the gig. “We’ll have to drive overnight!” one said. “It’s, like, 15 hours to Gainesville!” implored another in a whiny voice. The whinging continued right up until showtime. All of it, balderdash! We got a good night’s sleep and the drive is only 8.5 hours. And what a good time it was! We showed up at Murphy Weller’s house on Sunday night and promptly departed for the 3 Crow Bar sans Front and Mike and joined by Murphy’s girlfriend and reputable food blogger Emily. Did you know that the 3 Crow Bar actually sells white Russian frostees? They call them “bushwhackers.” The Dude would be proud, and also have a terrible ice-cream headache. After much haranguing by phone and text, were joined by the masked man himself, K.I.L.R.O.Y., and much reminiscing and general jollity ensued. 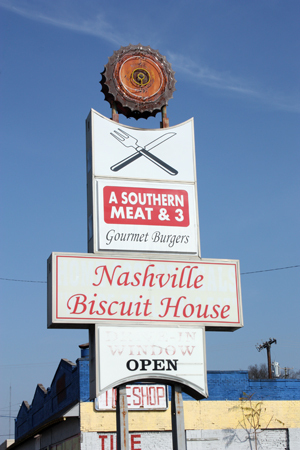 The next morning we headed for breakfast at the Nashville Breakfast House, which, were it a national chain, would probably unseat Waffle House. Afterwards Front and I departed for costumery and some last-minute music gear before rounding up the troops and heading over to the legendary Exit/In for load-in. First among the signs that this was an exceptionally legitimate venue was the fact that it had two green rooms, one of which we shared with the Protos. After sound-checking we headed over to CoCo’s for some sandwiches and what was apparently a Zack Galifanakis lookalike contest. Then it was time to put on costumes. Hooray for ridiculous holidays! Performing a highly physical set with unfamiliar and somewhat restrictive outfits proved a challenge for all members of the Frontalot crew. I was a cyborg zombie, with circuitry and control keys emerging from my bloody flesh; Frontalot was himself with a big There Will Be Blood-style moustache; Brandon was a Tattooine cantina band member; Sturgis was a banana. Despite these encumbrances, along with my last-minute (and unannounced) decision to play the set in character, the show went over well, which was good considering it was streamed live on the internets. The crowd dug it, and afterward we went (mostly) back to our regular clothes and went into the crowd to watch the Protomen rock out. And rock out they did! 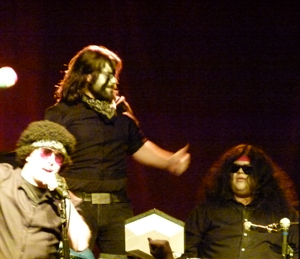 Dressed as former, dead and missing members of the Protomen, including Panther in a helmet-defying wig and Dennis DeYoung moustache, the Protomen did what they do best and riled the crowd up into a frenzy of rock-and-roll euphoria. If you haven’t seen them play or listened to their albums, I suggest you do so right now, because they are fantastic. And unpredictable! For instance, they launched into an amazing cover of “Danger Zone” which Panther sang with no sign of strain on his envy-inducing voice. Even they were unprepared, however, for the man dressed up as Commander, who stole the end of the show by actually getting behind the keyboard rig. On Halloween, anything can happen! Such as, for instance, someone coming to Front’s merch booth with a copy of my album and my video DVD looking for me to sign it. What world is this? I was literally speechless and trembling as the woman holding my merch items held them out for me to sign. She was, you see, one of the donators to my Kickstarter campaign from 2010. Anyone else on the remaining tour routing who wants their schwag signed, come on over to the shows! It makes me feel ever so slightly less culturally insignificant when you do. 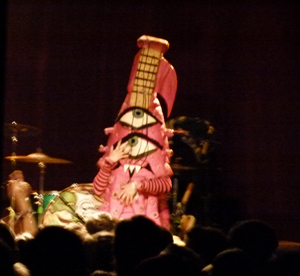 Last up on the bill was the who-could-have-expected-that experience of the inimitable Peelander-Z. They described themselves to me backstage as “punk rock” but they are more like absurdist performance art with a punk soundtrack. Antics such as squid bowling, crowd-standing, audience members playing the instruments and innumerable costume changes drove the crowd wild and made for a fairly spectacular end to the evening. It does not do them justice to merely describe them; you have to go see them for yourself. I will say that I’ve got a feeling they’re big fans of bad sci-fi films. Also that they are all very nice people! * Editor’s note – since this blog was posted after the show, that doesn’t make sense. Be more timely with your entries or you’re fired! Great post. I just wanted to thank you for dragging the crew to Nashville! It was great to learn of the story behind it. I’m what you would call your ‘core audience’ – 30-something software developer surrounded by non-geeks and looking for a nerd outlet. I’m a noob to both you and Frontalot, but I was introduced at this show and now you may consider me a fan. I must say, you give a convincing performance. Both musically, and character-wise… I was convinced you were a cyborg.